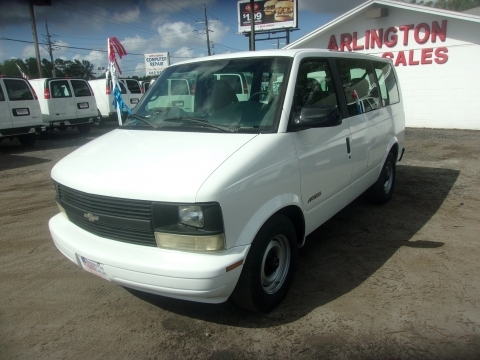 Description: 2001 Chevrolet Astro 8 Passenger Van. 57,236k miles, 4.3l Vortec V6, Automatic, Air Conditioning, Power Windows, Power Locks, Power Mirrors, Cruise Control, dual air bags, am/fm/cd stereo, White with Charcoal interior. Any questions please call John at Arlington Auto Sales 904-724-0444 and visit our website at www.arlingtonautosales.com to view the rest of our inventory. Price does not include $199 dealer fee or appropriate sales tax for your area. TAG is COD. VIN#1GNDM19W81B144590, STK#144590R.